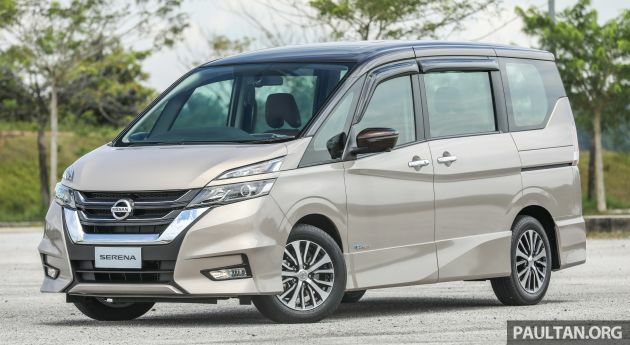 The new Nissan Serena S-Hybrid has been teased since late March, and its arrival on the market comes full circle at today’s official launch at 1 Utama. As before, the mild hybrid version of the fifth-generation MPV, codenamed C27, arrives here in locally-assembled (CKD) form. Pricing starts at RM135,500 for the Highway Star variant and RM147,500 for the Premium Highway Star. All prices are on-the-road without insurance, inclusive of a five-year, unlimited-mileage warranty and a three-year/60,000 free service package. Power comes from a carryover MR20DD 2.0 litre direct-injected four-cylinder petrol engine, now making slightly more power at 150 PS at 6,000 rpm and 200 Nm at 4,400 rpm. It’s fitted with a new dual-arm tensioner to reduce tension on the arm belt and improve fuel efficiency, and is mated to an Xtronic CVT. Working alongside it is a 2.6 PS/48 Nm ECO electric motor that replaces the starter motor, controls the Idling Stop System and and energy regeneration. The motor also offers acceleration assistance to the MPV, providing a 50 Nm torque boost for up to one second when moving away from a standstill. As for fuel consumption, Nissan claims the Serena is good for 14.2 kilometres per litre on the European NEDC cycle. On the outside, the Serena features a more distinctive design compared to its predecessor, with dual-tier headlights, a more expressive V-motion grille and a character line that sweeps downwards, contrasted by the upswept window line. Vertical tail lights feature as before, while blacked-out A- and D-pillars provide a floating roof that is emphasised by the Premium Highway Star’s two-tone colour scheme. 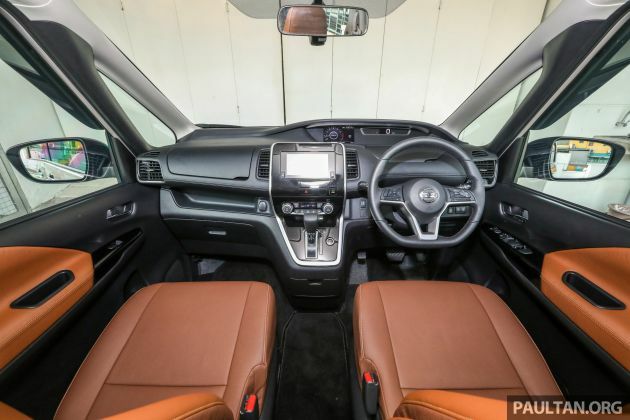 The interior is more modern with a stitched soft-touch dashboard, a flat-bottomed steering wheel and a floating centre console. The larger digital instrument cluster features a seven-inch multi-info display that shows the rev counter and the around view monitor with Intelligent Moving Object Detection (i-MOD). Unlike the previous eight-seater Serena, the new model has seven seats with second-row captain’s chairs with armrests. This means that the outgoing model’s second-row centre seat, which could be folded and slid forwards to double as a storage console in front, is missing here. On the plus side, the first- and second-row seats feature Zero Gravity technology for improved comfort, and there are also seven USB ports all around the car – including two each for the second and third rows. The third row can now also be slid forwards and back for either increased legroom or a larger boot. Access is improved though a new hands-free opening function for the twin power-sliding doors, operated using a kicking motion under the doors, while opening and closing buttons have also been fitted for the third row. A split-opening tailgate provides easier access to the boot in tight spaces. As standard, the Serena comes with LED headlights, front and rear fog lights, 15-inch alloy wheels, keyless entry, push-button start, single-zone auto climate control, rear air-con controls and a Clarion head unit with a 6.75-inch touchscreen and Apple CarPlay and Android Auto compatibility. Safety wise, there are now six airbags instead of two, joining the existing ABS with EBD and brake assist and stability control. The Premium Highway Star variant adds 16-inch alloys, door visors, combination leather upholstery in either black or two-tone Truffle Brown and Chestnut, a 10.1-inch roof-mounted LCD rear display, a Tech-On tray mat on the second-row picnic table for holding tablets or other devices, an LED interior room light and V-Kool 4Mil security film tinting. The new Serena will be offered in Brilliant White, Tungsten Silver, Diamond Black and Cashmere Gold colours. The Premium Highway Star adds three two-tone exterior colour schemes, including Cashmere Gold with an Imperial Umber roof as well as Tungsten Silver and Brilliant White with a Diamond Black roof. Browse full specification and equipment of the new Nissan Serena S-Hybrid on CarBase.my. 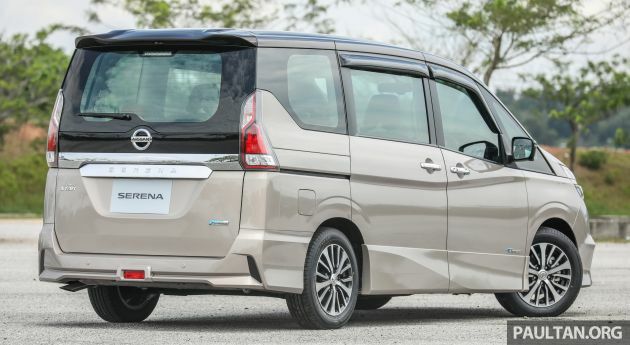 Nissan Serena balek kampong coming Raya..
you can request for Propilot model to be imported in from Tan Chong. Do you have booking fee ready? your loan can be approved? Selling price for Propilot would be 200k? Too ex? then shut up and buy this model la. ETCM wun do parallel impots lah. To get Nippon specs need to go via AP. I hear Rafidah is back…. AP Queen is back, sure cannot scrap anymore. P1 shud launch a affordable rakyat MPV. Nissan too costly..
Alredi have. Its called Exora. 6 airbags, ABS with EBD and brake assist and stability control. The cheaper variant would suffice as it has most of the required items and yes the seats are black in colour too. You are correct, and the article has been amended. Thanks for pointing it out! The kicking motion is only available for the Premium variant. Halogen lights for low spec and LEDs for Premium. Oso got other features diff too. Please re confirm this. handsfree door standard for both variants. you are a troll, go away. get out of here. Thats not what was informed during their insider preview for new Serena. Go ask ur salesman. Might as well just get a vellfire recond for about the same price. Saw this mpv in setia city mall a week ago it was quite impressive but the funny thing is the salesman who tried to demo the hands-free opening of the sliding door couldn’t make it work. It took him several attempt of swinging his foot or kicking motion under the door before the door finally opened. This is not a good indication Tan Chong. The technology should have been proven first before being put into the product. One would look silly standing there next to your car hands full and making a weird dance move in attempt to open the door..LOL. Perhaps, instead of this hit or miss tech, they should have put in a powered tailgate at this price point. If the 2018 Serena comes with 6 seat safety belt buckles, should Tan Chong market this Mpv as a 7 seater? He didn’t try the sports mode performance. Maybe he didn’t know there is a sports mode? New Nissan Serena everything is good except the 7/8 seats change to 7 only… Like my family members have 8 people, because i stay with my parents, it became unsuitable now. Short of one seat!!!!!!!!! I heard that serena having gearbox problem. Its true?